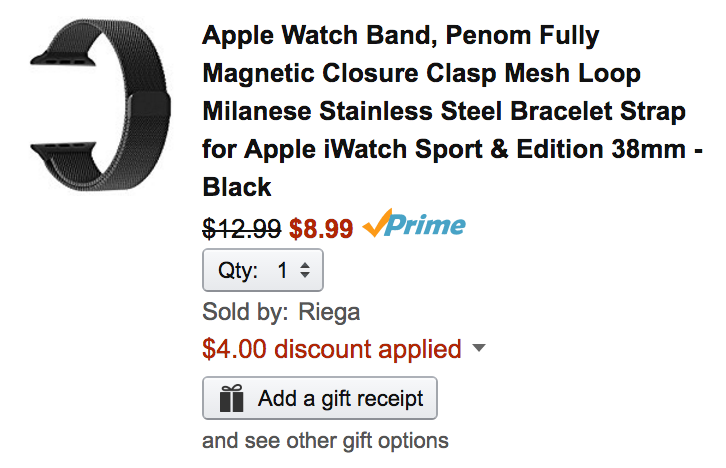 Riega (100% positive feedback from 4,460 customers) via Amazon its offering its Milanese Loop Apple Watch Band in two colors and both sizes from $6.44 Prime shipped when an item-specific promo code is applied. Rated 4.3/5 stars by over 3,300 Amazon customers. Top stainless steel mesh loop in a warm, black color, really dress up your Apple watch; Fit for all Apple watch 38 mm Series 1 & Series 2, wrist size: 6.10 Inch – 9.45 Inch. Black mesh loop with durable adapters, very comfortable to wear and easy to install; Replace 42mm Apple watch band easily and directly. Strong magnetic clasp, convenient for you to adjust the size; Ensure your watch in steady and secure, no problem for most sports. One Year Warranty. We are happy to send out a replacement band if your band has any quality issues, please kindly let us know.